Chinese food, you’re probably getting bored of it by now. Takeaway sweet and sour pork comes way down the fast food list after curry, Nandos, KFC and new wave “streetfood”. Going out for a meal? 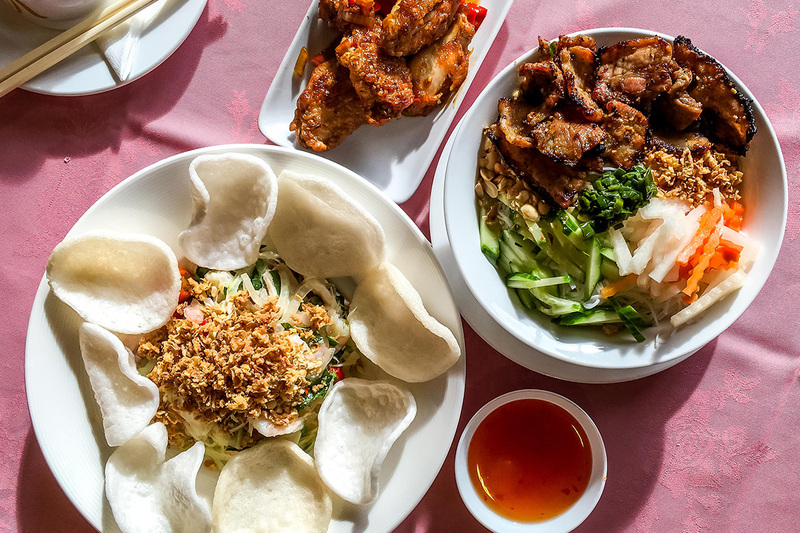 Sesame prawn toast, chow mein, lemon chicken, shredded crispy duck and all the other anglicised Chinese food is seen as the safe option for a crowd with fussy eaters. But it doesn’t have to be like this. The Chinese food that I know has never been like that anyway. With more and more mainland Chinese folk living in the city, the options are expanding beyond the watered down Cantonese fare we all grew up eating in the UK. 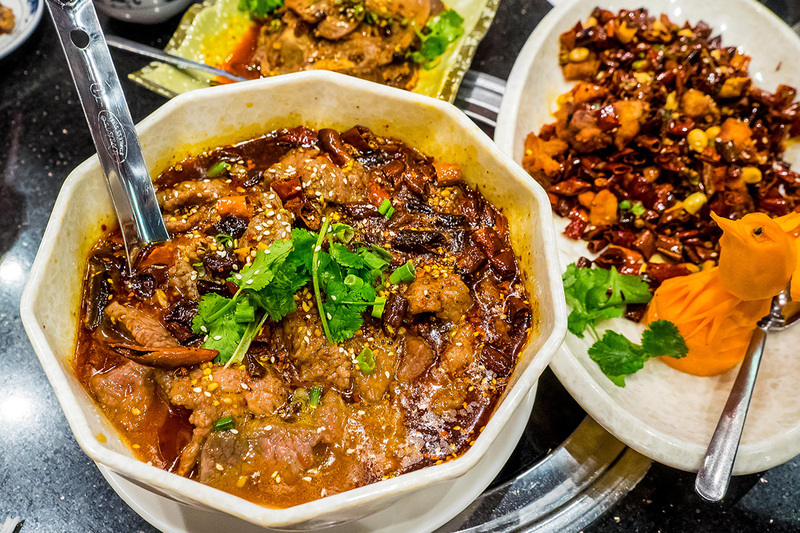 Fiery mouth numbing dishes from Sichuan, mutton skewers from the North, hotpots and hand-pulled noodles. Never let them show you the English menu ever again. 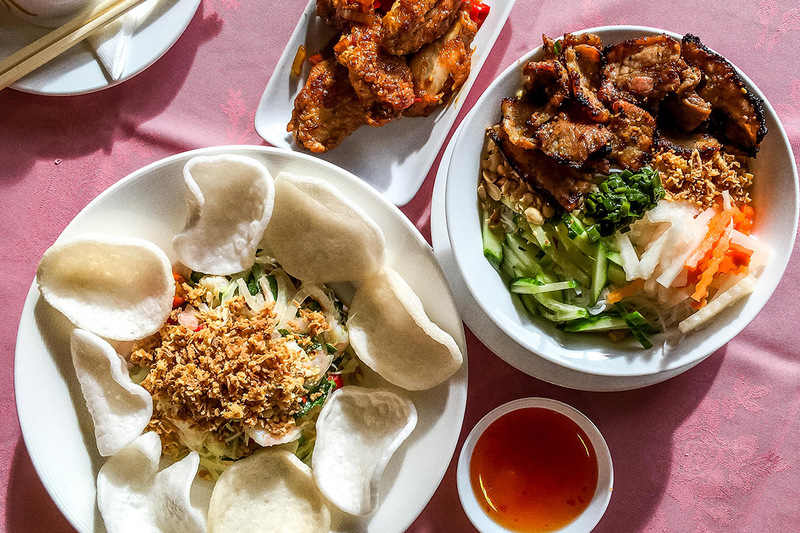 I’ve written guides about the great mainstream food you can get in Birmingham’s Chinatown but for BabMag here’s a guide to get really under the skin of Chinatown. Pepper Chef is an oddball, serving up pan-regional Chinese dishes like Rou Jia Mo (Chinese hamburgers) and grilled skewers of every description. You can see them cooking in the open glass-fronted kitchen right in front of you. 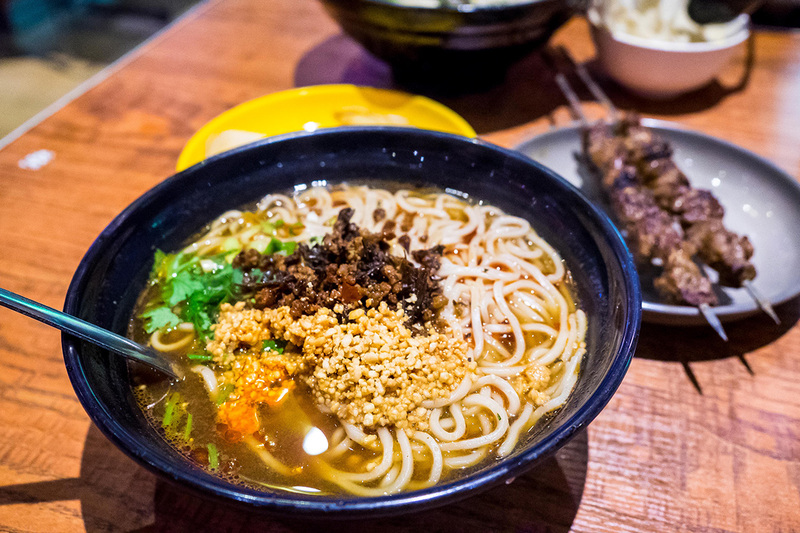 If you order a bowl of noodles you’ll also see one of the chefs making the noodles, pulling or cutting them to size. Not everything on the menu is great but through trial and error, I’ve hit upon my own winning combination of spicy dandan noodles, mutton skewers and delicately flaky durian pastries. It’s a complete meal for one and always deeply satisfying. If you’ve never tried the notoriously stinky durian fruit then the pastries here are a good introduction to their heady aroma. You already know that the triple roast rice is the single best value dish you can get in Birmingham, that both Peach Garden and its splinter Look Inn serve excellent examples of this for less than the price of a cinema ticket. What? You didn’t know this? 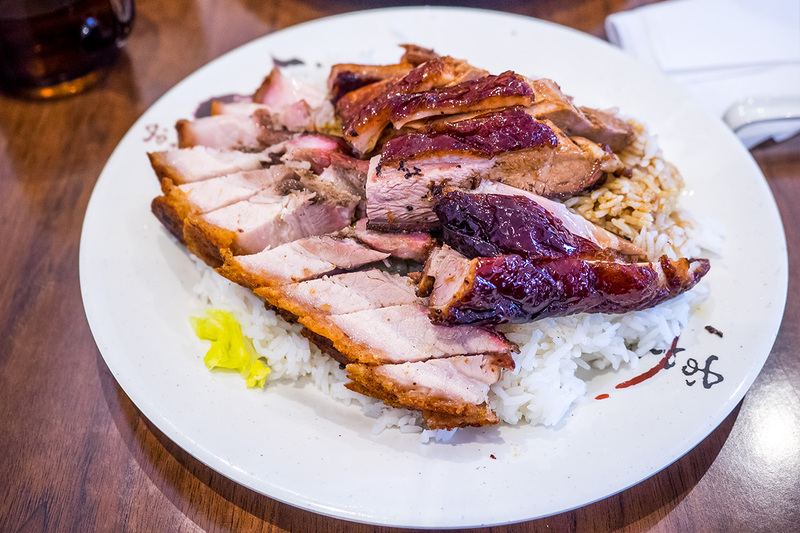 You need to get yourself familiar with a plate of perfectly cooked rice topped with a mound of crispy belly pork, sweet BBQ pork and roast duck cooked. It’s cooked fresh every day of the year and for around £7 it makes a nonsense of every fast food joint and so-called artisan streetfood vendor in the city. Every Monday and Tuesday lunchtime something even better happens, both these roast meat specialists roast a suckling pig. If you’re lucky enough to arrive before it’s sold out then for around a tenner you could be eating suckling pig with perfect crackling and sweet tender meat. The only catch is it sells out quickly, sometimes within half an hour, so get ready to eat elbow to elbow with throngs of Chinese people. For a thousand years Vietnam was part of China so there’s been some influence on the food culture. On the other hand, Song Tuoi has been in Chinatown for less than one year. If you’ve never tried Vietnamese food you’ll notice some crossover; spring rolls, fried noodle and rice dishes. You have to stick to the Vietnamese menu here because there’s also a world food menu. Punjabi mixed grill and pizza sit alongside authentically fresh and delicious Vietnamese dishes. Prawn and pork papaya salad is bursting with fresh juicy prawns and crispy shredded papaya, the chilli fish sauce dressing pulling everything together. It’s worth coming for this plate alone, but if salad seems too healthy then order the grilled pork noodles and fried chicken wings to help balance it out. Song Tuoi doesn’t really know if it’s a bar or a nightclub or a restaurant. Let alone whether it’s solely a Vietnamese restaurant. If you treat it so then you’ll be rewarded with the best Vietnamese food in town. The decor in Tasty Restaurant hurts my eyes. Dark surfaces punctuated with bright red flourishes. The buffet style food at the entrance looks intimidating, unidentifiable organs, other bits of animal and a chest freezer of sliced meats for hot pot but I always steer clear. Hot pot is the popular Asian way of cooking your food by poaching it in a cauldron of boiling broth set in the middle of the table. However, I recommend never ordering it because the a la carte Sichuan dishes are the best I’ve had in town. The cooking here is a cut above the rest. Evidenced by the dry fried chicken and chilli dish that comes with a mountain of chilli and mouth-numbing Sichuan pepper but also the daintiest carved sparrow. The chilli beef tripe will turn those squeamish about organ meat into connoisseurs of the fifth quarter. Perfectly fried green beans and garlicky aubergines balance the fearsomely spicy meat slices in chilli broth. This is food that dampens the brow and makes the pulse flutter. A match for any curry in Birmingham and Beyond. For all intents and purposes, Family Restaurant is just another typical Chinese takeaway. It’s just big enough to seat half a dozen people if you wanted to eat in. So why would you bother? Well, I know that the chef here can really cook. He used to be the chef at the late lamented Manchester Seafood restaurant where I’ve had some the best meals in my 30 years of eating in Chinatown. When someone like that opens even a small takeaway you need to take notice. 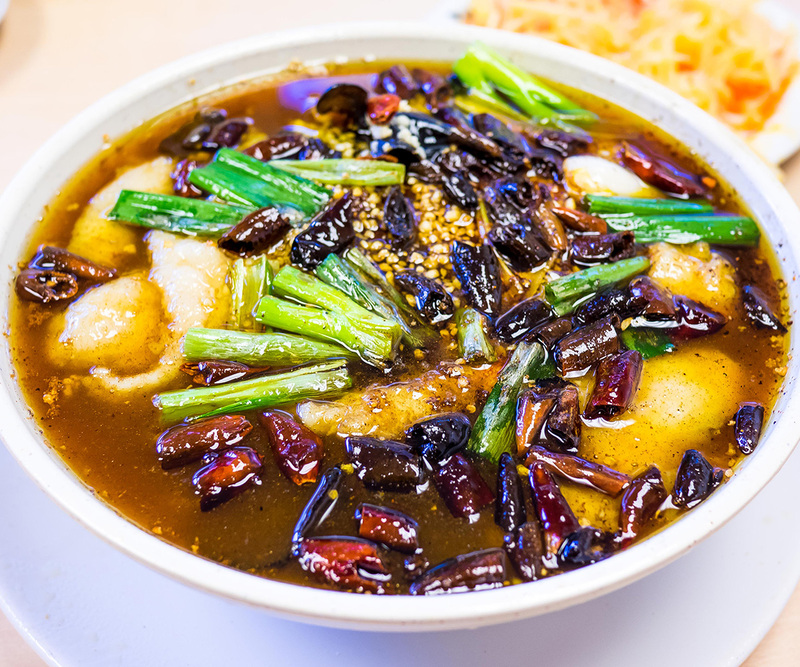 The menu here floats around Cantonese and Sichuanese dishes. Excellent braised pork and pickled mustard greens, perfect beef slices and tripe in chilli oil, the expertly sliced raw potato salad confirms you’re in safe hands. Do not expect any frills here or any kind of cohesive service. Just good food. Welcome to China. Welcome to Chinatown.